Home » Testimonials » Thanks so much for your company; it eventually made a big difference for four people. Thanks so much for your company; it eventually made a big difference for four people. 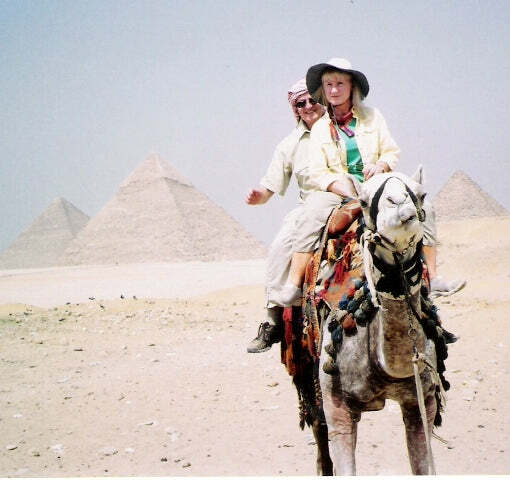 In June 2008, my husband and I went to Egypt on a tour. Knowing it was going to be incredibly warm, I consulted a friend who has been several times. He said, “You will need one of those cool bandanas. If you don’t have one, you’ll be sorry. My friend gave me one, but I have no idea where you can find one.” Without any luck whatsoever, I made calls and pilgrimages to every sports store and department in the usual big box stores in our area of Colorado. FINALLY, I had the presence of mind to turn to the Internet and found your site, Polar Breeze, when I “Googled” the keywords “Cool Bandanas.” We ordered four of them. Our first day out on the tour was at Giza and the Great Pyramids. As you will see in our picture on “KFC the Camel,” my husband forgot his bandana, but I was so glad to have worn mine! It was over 100 degrees that day. The rest of the tour, we both remembered to wear them and were the envy of our group. Feeling sorry for some of the sufferers, we offered our extra two to them. Thanks so much for your company; it eventually made a big difference for four people.